An algal bloom floats alongside a ship in western Lake Erie. Current research focuses on identifying the causes of these harmful blooms and predicting when and where they will appear. Photo by Justin Chaffin. Gerald Matisoff surveyed an expanse of green. It stretched as far as the eye could see, in every direction, like the smooth manicured turf of the world’s largest and most boring golf course—no bunkers or other topographical diversions, no water hazards, no sand traps, no little flags marking the holes. People began paying serious attention to Lake Erie’s algal blooms back in the 1960s, alarmed by the unsightly slide of green over blue in parts of the lake and the resulting loss of oxygen, which caused dead fish to pile up on shore. 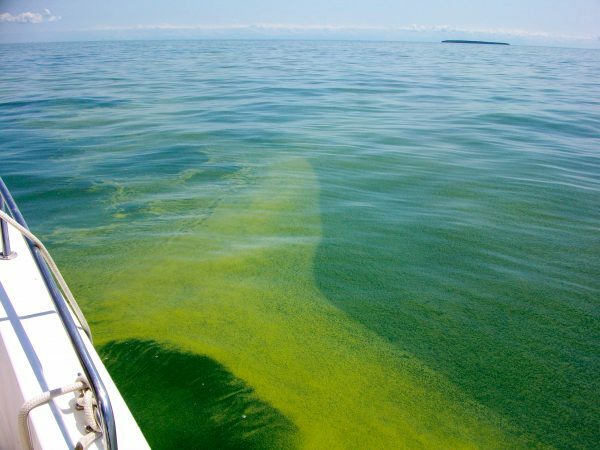 Scientists determined that the algae was thriving on the excess of phosphorus that human activity dumped in the lake, mainly from sewage plants but also from fertilizer runoff from lawns and farms. The United States and Canada joined forces to monitor the lake and regulate some of the pollution, requiring sewage plants to remove phosphorus from wastewater and put it in landfills. This multibillion-dollar remediation helped the sick lake—at one point dubbed “North America’s Dead Sea”—gradually return to health by the mid-1980s. 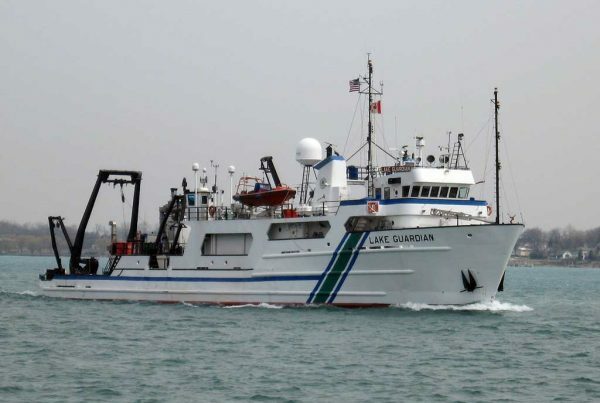 The Research Vessel (R/V) Lake Guardian, operated by the U.S. Environmental Protection Agency, monitors water quality in all of the Great Lakes. 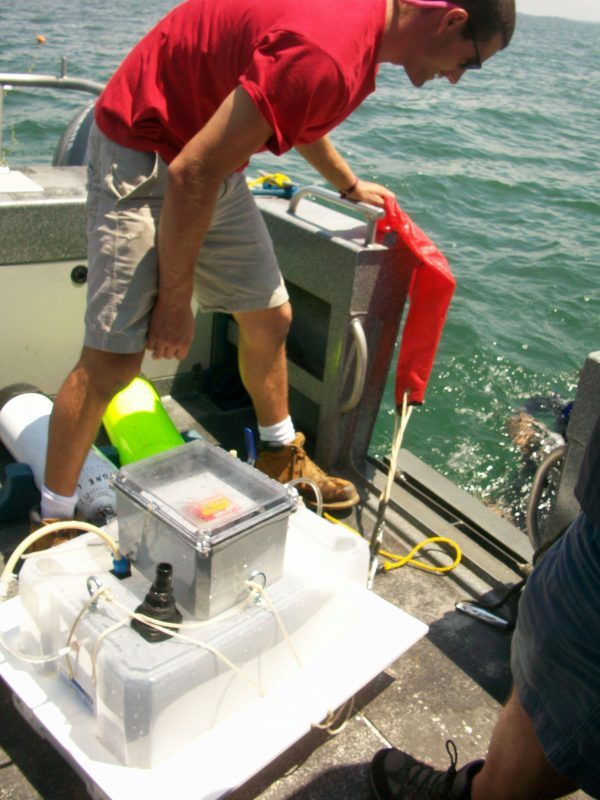 When possible, the EPA allows researchers, including Matisoff and his students, time on the ship to conduct their sampling. Photo courtesy of Environmental Protection Agency. 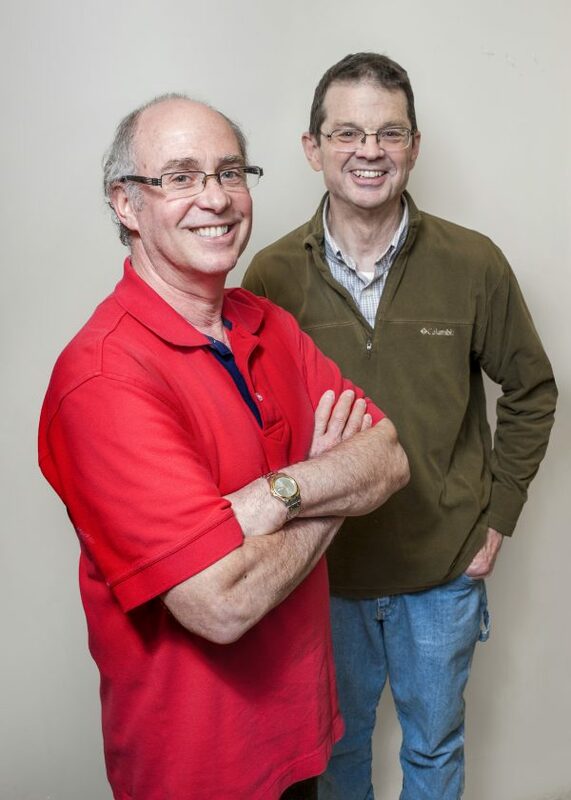 From left: Professors Gerald Matisoff and Peter McCall are studying the recycling of phosphorus in Lake Erie—a process that contributes to the formation of toxic algal blooms. Photo by Mike Sands. But in the 1990s, algal blooms reappeared on the lake and have maintained an unwelcome presence ever since. Every year, various types of algae begin blooming in the extreme heat of August. The greatest threat to humans and other mammals comes in September, when parts of the algal mats become dominated by a cyanobacterium—often referred to as blue-green algae—called Microcystis aeruginosa. Microcystis has been present in the lake for at least a century but has only reached a nuisance state in recent years—a big problem, since it contains a toxin so virulent for mammals that the military has investigated weaponizing it. In 2014, an intake pipe for Toledo’s water treatment plant sucked up part of an algal mat thick with Mycrocystis, and toxins flooded the drinking water. As in the 1960s, Lake Erie’s water-quality problems made headlines around the country. That attention has brought renewed interest to the work of Matisoff and other Case Western Reserve scientists, who for decades have been researching the many interacting factors that affect the health of the lake and the creatures that live in it. Policymakers and the public want to know what steps are needed to safeguard drinking water. Many have called for clampdowns on the remaining sources of phosphorus—in particular, farming practices throughout the watershed that allow phosphorus from agricultural chemicals to run into the Maumee River and then into the lake, where it nourishes photosynthesizing organisms like Microcystis. Matisoff’s students insert a plastic tube into a gravity corer, an instrument used to collect sediment cores. 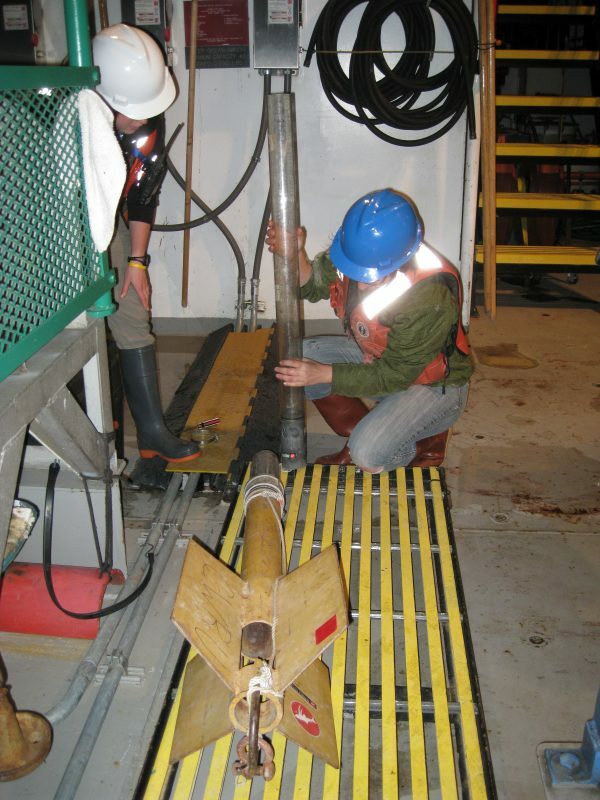 A 1-meter core may contain a sediment record that extends as far back as several hundred years. In longer cores, the record may extend as far back as several thousand years. Photo by Gerald Matisoff. Matisoff is approaching this question by investigating the continuing impact of the phosphorus already in the lake. Part of the trouble, he says, is that this phosphorus is being recycled. When dead algae and other organic material float down to the lake bottom, they are eaten by organisms living in the sediments. This biological action releases the phosphorus contained in the decomposing matter, making it available to new algal blooms. For this reason, cutting off external sources of phosphorus won’t immediately make the blooms disappear. Those who live along Lake Erie’s shores and venture onto its waters know that it is changeable—sunny and smooth one hour, whipped by waves the next—but no one appreciates its complexity as much as the scientists trying to figure out its secrets. Lake Erie is a puddle the size of New Jersey lying atop mud and sand, glacial debris and a basement layer of 400 million-year-old limestone and sandstone. Most of us don’t give much thought to that layer, or to lake and ocean floors in general. And yet, taken together, they are the largest geological feature on Earth. “It’s the biggest habitat on the planet and the best preserved,” says Professor Peter McCall, one of Matisoff’s department colleagues and director of the Environmental Studies Program. McCall studies the influence that tiny creatures living on the lake bottom have on water quality. This habitat’s ancient history—and the light it sheds on the lake’s present condition—is the concern of Associate Professor Beverly Saylor, a specialist in stratigraphy and sedimentology. When she first joined the faculty in 1998, Saylor began probing the evolution of Lake Erie since the last ice age. She carried out her early work in collaboration with Enriqueta Barrera (GRS ’80, ’83, ’87), then a professor at the University of Akron and now a program director at the National Science Foundation. Saylor’s first foray to collect data from Lake Erie’s distant past occurred in 2002, when she and some students boarded the Canadian Coast Guard ship Limnos and sailed off to collect piston cores—sediment samples extracted from the lake bottom with long tubes. It was a queasy trip for the then-pregnant Saylor, but a successful one. By now, she has taken two more trips and amassed a collection of ten cores, including one from the lake’s central basin, near Cleveland, that is 32 feet long and dates back 7,000 years. Geological history traces one cause of the lake’s current water-quality problems. When the glaciers that carved out the Great Lakes receded 10,000 years ago, Lake Erie wasn’t connected, as it is now, to Lake Huron, through the Detroit River, or to Lake Ontario, through the Niagara River. However, as the weight of all that ice disappeared, the land mass gradually rose again over a period of 5,000 years. This shift opened Lake Erie’s connections to the two other lakes, and it caused irregularities in the lake’s depth. As a result, Lake Erie is really three different lakes, with average depths of 24 feet in the shallow western basin, 60 feet in the central basin, and 80 feet in the eastern basin. These variations set the stage for the chronic problem of anoxia—the absence of oxygen—that plagues Lake Erie’s central basin today. Graduate student Mary Carson collects suspended sediment from the Ashtabula River, a Lake Erie tributary. 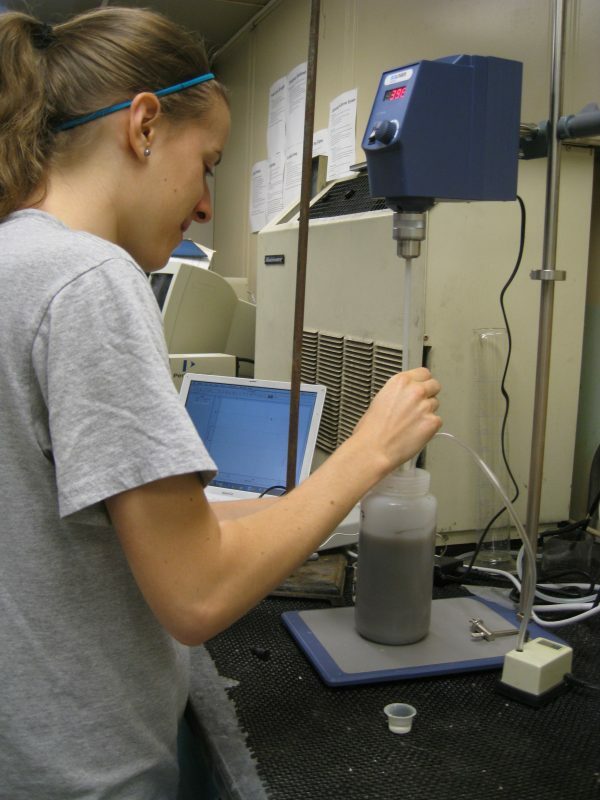 The collected sediment is later analyzed in a lab at CWRU to provide information about the chemicals the river delivers to the lake. Photo by Gerald Matisoff. Anoxia isn’t an issue in the winter; when the oxygen-rich surface waters are cold, they mix readily with the cold waters below. But once the surface water begins to heat up in the spring, it loses density and doesn’t mix as readily with the denser cold water beneath it, so new oxygen isn’t introduced at depth. At the same time, warmer temperatures overall prompt greater activity among the billions of tiny creatures living at the bottom of the lake—including bacteria busily decomposing organic material such as algae, which blooms in the western basin, blows eastward, dies and drifts to the lake floor. Since all those creatures require oxygen, their increased activity as the summer begins removes oxygen from the deeper waters. 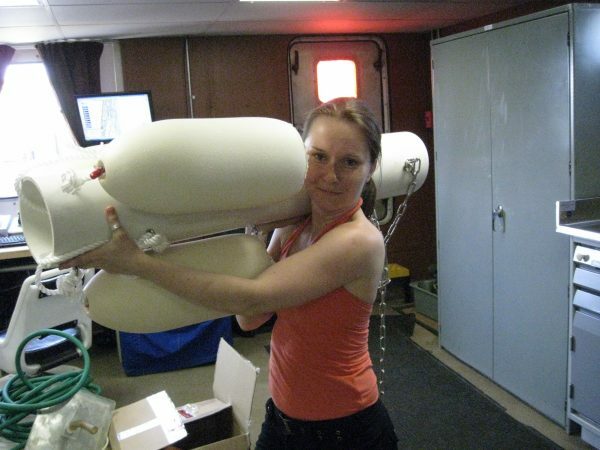 Eliza Kaltenberg, a graduate student in the Department of Earth, Environmental and Planetary Sciences, carries a trap for suspended sediment from the lab on the R/V Lake Guardian to the back deck for deployment. Photo by Mary Carson. Figuring out all the factors that create anoxia, and figuring out how all the different water-quality issues affect each other, is a huge task. That’s because Lake Erie—the shallowest of the Great Lakes, and the smallest by volume—is the most dynamic and changeable member of that watery quintet. Its waters recycle every three years. While the waters of Lake Erie recycle rapidly, the muddy environment at the bottom is much more stable. Matisoff first developed an interest in this mud and its contents when he began studying sediments that the Army Corps of Engineers dredged from the Cuyahoga River and dumped in the open lake. Matisoff and McCall examined how contaminants in these sediments circulated into and out of three-and-a-half feet of mud on the lake floor. Tyler Steube, a field station assistant for The Ohio State University’s Stone Laboratory, assists divers in the deployment of a bottom chamber designed by Gerald Matisoff. Water samples collected from the bottom chambers provide important information about the internal recycling of phosphorus and other materials that impact the water quality of the lake. Photo courtesy of Stone Lab. This early work led naturally to studying the circulation of phosphorus. In one investigation last summer, Matisoff deployed contraptions of his own design on the lake floor to see how much of the lake’s phosphorus was seeping out of the mud. He carried out this research as a participant in the Great Lakes Restoration Initiative, a $500,000 project funded by the U.S. Environmental Protection Agency and administered by the Ohio EPA’s Lake Erie Commission. 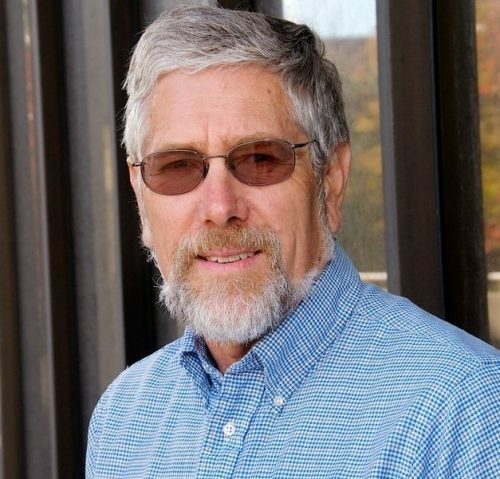 In addition to Matisoff and students from his department, the project includes scientists from The Ohio State University’s Stone Laboratory, the University of Toledo, Heidelberg University, the U.S. Geological Survey and a private consulting firm. Stephanie Hummel (CWR ’14) sets up an experiment to determine the amount of phosphorus released when bottom sediments are resuspended in the lake. Photo by Gerald Matisoff. With more than 1,000 hours of diving behind him, McCall has finally hung up his scuba gear. Now he concentrates on experiments in his lab. In one, he sets up environments that look and function like ant farms, six inches across and a foot tall, filled with mud and water and organisms, most of them microscopic. Matisoff is combining new data about the impact of these tiny creatures, and about the circulation of phosphorus in and out of the sediments, with other data in a complex computer model that generates predictions about the lake’s water quality. For instance, the model predicts when and where problems like algal mats might occur and what factors might abate them. So far, his calculations don’t provide simple answers for lakeside dwellers who want to prevent the recurrence of the algal blooms. Even if people take steps to stop the flow of new phosphorus from farming operations along the Maumee and Sandusky Rivers, it will take time—perhaps 10 to 15 years—to reduce overall phosphorus levels to the point where the blooms completely stop. There’s no easy fix. Science writer Kristin Ohlson is the author, most recently, of The Soil Will Save Us: How Scientists, Farmers, and Foodies Are Healing the Soil to Save the Planet. Joseph Koonce, professor emeritus in the Department of Biology, began studying Lake Erie’s fisheries in the 1970s. Photo by Daniel Milner. Like all nutrients, phosphorus isn’t necessarily a bad thing. Without the historic surges of phosphorus from the wetlands that once surrounded Lake Erie’s western basin, the lake would not have become the tremendously rich fishery that led Native Americans and Europeans to cluster along its shore. Even now, Lake Erie’s sport and commercial fishery is worth well over a billion dollars annually. But when Koonce began studying Lake Erie in the 1970s, the sturgeon and the wetlands—by then replaced with farmland—were long gone. Alarmingly, the walleye, one of the lake’s other great delicacies, was also in precipitous decline. Koonce and others started examining the many factors affecting the decline and plugged data into large-scale ecosystem models. Recovery strategies followed. By the 1980s, the walleye were back in force and Lake Erie was the walleye fishing capital of the world. Weirdly enough, however, that resurgence may have opened the door to the invasion of the infamous zebra mussel. This freshwater mussel from Russia likely entered the lake through illegally dumped ballast water from oceangoing ships. Though the zebras were probably introduced many times before, conditions in the lake during the 1980s were ripe for their rapid expansion. The zebra mussels went on to disrupt the food chain in the lake, adversely affecting everything from worms living in the sediments to fish. Some scientists also suspect that the zebra mussels’ feeding habits hasten the deposition of phosphorus on the bottom of the lake and contribute to its recycling. Since Koonce retired from the faculty in 2012, his research has taken him far from the lake to study how land-water interactions throughout the greater watershed work their way down to Lake Erie. “Mosaics of biological features act to shape the overall landscape and affect things like runoff,” he says. As part of this watershed focus, he’s become involved with the Cleveland Botanical Garden’s Vacant to Vibrant research program. The program repurposes vacant urban parcels by installing soil and vegetation—”green infrastructure”—to control runoff.